27 Aug 2017: at AAO: Water Pushes Sand (Museum of Old and New Art (MONA)). Featuring Australian Art Orchestra, Peter Knight. 24 Aug 2017: at AAO: Water Pushes Sand (Braybrook Hub). Featuring Australian Art Orchestra, Peter Knight. 23 Aug 2017: at AAO: Water Pushes Sand (Ainslie Arts Centre). Featuring Peter Knight, Australian Art Orchestra. 22 Aug 2017: at AAO: Water Pushes Sand (The Jazzlab). Featuring Australian Art Orchestra, Peter Knight. 17 Aug 2017: at AAO: Water Pushes Sand (Darwin Entertainment Centre). 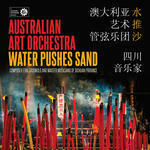 Featuring Peter Knight, Australian Art Orchestra. 10 Oct 2015: at Water Pushes Sand (Fairfax Studio). Featuring Erik Griswold, Australian Art Orchestra. 9 Oct 2015: at Water Pushes Sand (Fairfax Studio). Featuring Erik Griswold, Australian Art Orchestra. 3 Oct 2015: at Water Pushes Sand (Space Theatre - Adelaide Festival Centre). Featuring Australian Art Orchestra, Erik Griswold. 2 Oct 2015: at Water Pushes Sand (Space Theatre - Adelaide Festival Centre). Featuring Erik Griswold, Australian Art Orchestra.